Soupe à l’oignon is a staple of French café culture, and Paris-based cookbook author David Lebovitz takes the cheese-capped classic from the brasserie into the home kitchen with this simple, yet oh-so-delicious recipe from his most recent book, My Paris Kitchen. Melt the butter in a large pot or Dutch oven over medium heat. Add the onions and sugar and cook for 20 minutes, stirring occasionally, until soft and translucent. Add the garlic, salt, and pepper and continue to cook for 1 ½ hours, stirring less frequently and decreasing the heat to avoid burning as the onions continue to cook down. As the onions cook, if they brown on the bottom of the pan in places, use a spatula to scrape those appetizing brown bits into the onions because they’ll add flavor. The onions are done when they have collapsed into a thick amber-brown paste. Stir in the flour and cook, stirring constantly, for 1 minute. Add the wine and use a flat utensil to loosen any and all brown bits from the bottom and sides of the pan, stirring them into the onions. Add the stock, bring to a boil, then decrease the heat and simmer slowly for 45 minutes. Turn off the heat and add the vinegar, tasting it to get the balance right, adding a touch more vinegar, and salt and pepper, if desired. Preheat the oven to 400 degrees F. Set six ovenproof bowls on a baking sheet lined with parchment paper or aluminum foil. Divide the hot soup among the bowls. Rub both sides of the toasted bread slices with the garlic. Put the toasts on the soup, then sprinkle the tops with the grated cheese. Bake the soups on the upper rack of the oven until the cheese is deeply browned, about 20 minutes. 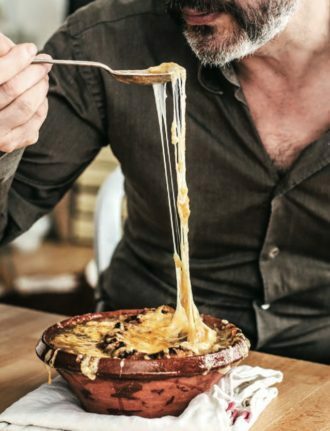 Alternatively, if your bowls can withstand the heat, you can set the cheese-topped soups under a hot broiler, cooking them until the cheese is melted and starting to brown. Serve immediately.